Looking at a fixer upper home? Why get an FHA 203k Loan? It's simple ... This loan allows you to buy a home needing a little TLC, and get the money to repair it all in one loan. Thousands of people are using the FHA 203k Streamline loan every single month. Let us help you purchase a MN or WI home with just 3.50% down, AND give you up to $35,000 more in money to fix the house, bring it up to code, or get paint, carpet, a roof, or even appliances. 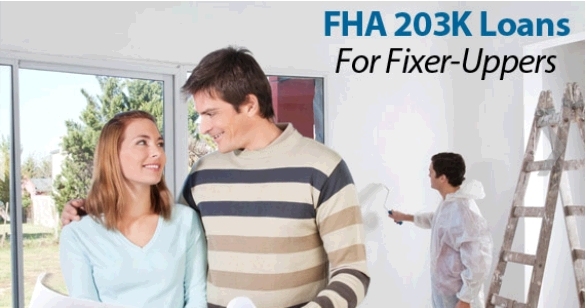 The FHA 203(k) loan is available to borrowers of all income levels, to homeowners who plan to occupy the house, and for homes with one to four units. Full and Streamline. Full is for repairs OVER $35,000. Few lenders offer this program due to it's risk and complexity. Streamline on the other hand is for repairs UNDER $35,000, and is offered by about half of all FHA lenders. Mortgages Unlimited ONLY OFFERS THE 203K STREAMLINE LOAN - This works for the vast majority of home repairs. These loans offer the ability to finance upfront up to $35K in upgrades to rehabilitate a home. These are offered up to the maximum FHA loan limit in your county. 1-4 Unit buildings - you can increase or decrease the number of units with this loan. Once your offer is accepted, contact us to guide you the rest of the way. Mortgages Unlimited, Inc. Nationwide Mortgage Licensing System and Registry (NMLS) # 225504 Saint Paul Branch - NMLS # 387944. Joe Metzler, Licensed Mortgage Loan Originator NMLS # 274132. Minnesota Lic/Reg #: MN-MLO-274132. Wisconsin Lic/Reg #: 11418. NOTE: We offer USDA, VA and FHA Loans. While we are an approved lender, we are not part of HUD, FHA, The United States Government, or the Department of Veteran Affairs. We are not acting on behalf of, or under the direction of HUD/FHA or the Federal Government. FHA and VA do not lend directly to the public, only through approved lending institutions like Mortgages Unlimited.